About | South Atlantic Capital Management Group, Inc.
South Atlantic Capital will focus on long term results and will not attempt to make short term predictions on the economy, the market, or investment trends. We invest in companies that have sustainable advantages, generate substantial free cash flow, and have high return on equity. Portfolios are typically invested in approximately 20-25 holdings, usually U.S. listed stocks and ADR’s. As the situation warrants, investments are made from time to time in fixed income and gold backed ETF’s. More income oriented accounts may own master limited partnerships. South Atlantic Capital will retain cash for buying opportunities. We believe that the best way to create a margin of safety against unexpected negative developments and market swings is to buy undervalued companies. 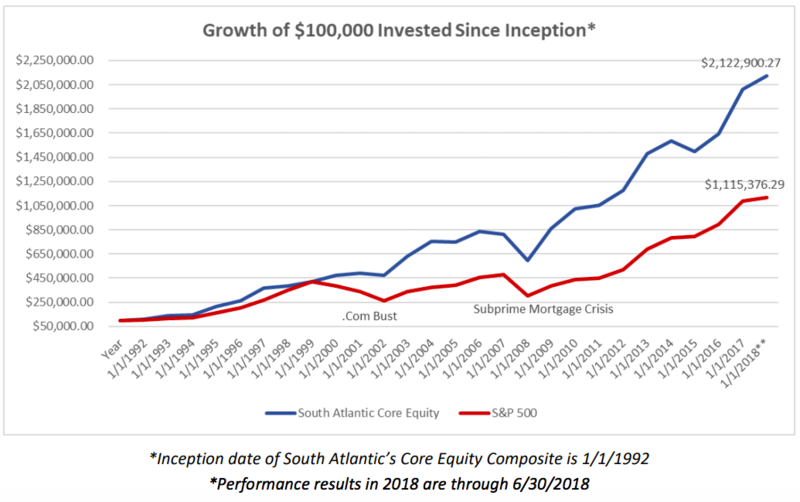 South Atlantic Capital’s flagship product is our Core Equity Composite. Since inception, January 1, 1992 through June 30, 2017, our Core Equity Composite's annualized return was 11.94%, net of fees, versus the S&P 500's 9.35% annualized return for the same period. *Data reported in chart above is for the period January 1, 1992 to June 30, 2017.